When someone asks me if it’s ok to put steel strings on a classical guitar, my reaction is that of horror! Well actually it’s more of relief – relief that they asked first and didn’t do it first and then ask later. The answer to this question is an emphatic no. Steel strings exert a lot more tension that nylon strings. In fact they produce roughly twice as much tension. That means that steel strings are putting a lot more pressure on your guitar. 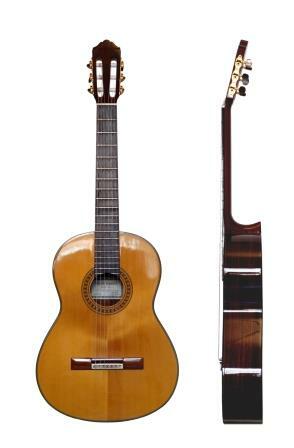 An acoustic steel string guitar is designed to take the extra tension of steel strings. A classical guitar on the other hand is designed with the intention of holding nylon strings – a much less burdensome task. When you buy Nylon strings you can actually buy them in different tensions – depending on what you like the sound and feel of and what type of music you are playing. It is even sometimes recommended that you should loosen off your strings on a classical guitar if you are using high tension nylon strings. This is to save damage to your guitar. Steel strings produce even greater tension than high tension nylon strings so imagine the damage they can do to your classical guitar. Leave steel strings for long enough on your classical guitar and it will become unplayable – if it doesn’t implode first! If it’s not yet clear – DON’T put steel strings on your classical guitar, unless you want to experiment with slowly destroying your guitar! If you really want to play with steel strings you will need to get yourself a steel string acoustic guitar. Thanks for reading and I hope this article has answered your question. Lol! Nice blog, funny when someone trying to put steel strings on classical guitar. I broke my string once but never thought of this idea. Yeah – I’ve seen it/heard about it all too often! Whenever I see it I cringe a little. Easy mistake to make though, when your new to guitars. Yes this is a no no. The extra tension added by the steel strings tends to make the neck warp so the the action becomes so intense that only the most callous finger can stand to play it for more than a few moments. I have bumped into this one a few times over the years and always wondered (before I figured out what was happened) who the heck would ever want to play this guitar…..? The answer of course was NO ONE, which is why those particular instruments always sat in the corner collecting dust.